A question I get asked quite often is "What are your favorite paints?" or "What kind of brushes do you use?" 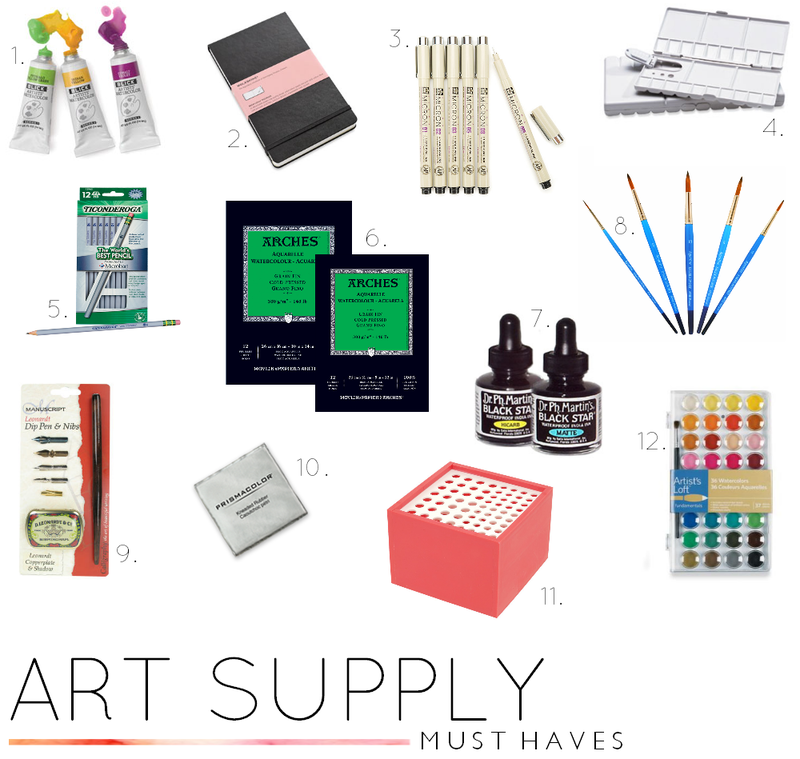 so I thought I would compile a list of my favorite art supplies and share them with you. 1.// I really love the colors of these Blick Artist's watercolor paints.You can buy each individual color and there are so many to choose from! 2.// I use my Moleskin watercolor sketchbook to doodle in. 3.// Everyone swears by Micron pens! 4.// I love this 28 well plastic folding palette, I use it all the time and it fold right up so the kids don't get in it! 5.// I've used Ticonderoga pencils since high school and our house is always stocked. 6.// Cold-pressed Arches watercolor pad. 7.// Dr. Ph Martin's India ink for calligraphy. 8.// I have a ton of different brushes but I really love these Dawler-Rowney watercolor brushes. I also have these from Artist's Loft for liner brushes. 9.// Recently I bought this Manuscript Leonardt dip pen set and I use it all the time! It's great for practicing and I love the storage tin for the nibs! 10.// Prismacolor kneaded eraser, because it's fun! 11.// This Paint brush holder, an upgrade from the mason jar. 12.// I have gone through two of these Artist's Loft water color palettes, I love them! They are so easy and the colors are great! The kids even have their own!